Kriya Arts produces multi-award winning, high quality events for a variety of clients and in a wide range of mediums. 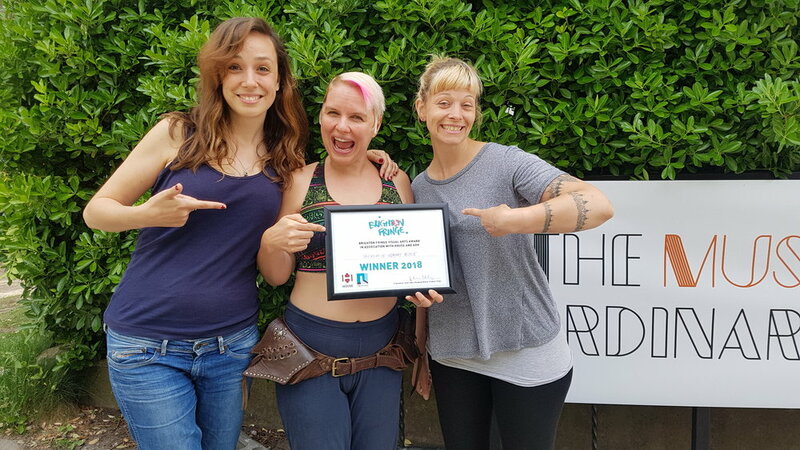 We won the The Brighton Fringe Visual Arts Award in Association with HOUSE and AOH, for the Museum of Ordinary People at The Spire as part of the Brighton Fringe Festival 2018. And took Sisterhood to Pleasance Beneath for the whole of August where is gained five and four star reviews, plus the accolade of Ground-Breaking Work from Fringe Review. In 2017 we went to the Edinburgh Fringe Festival with Rhum and Clay's new production TESTOSTERONE, as part of the British Council Showcase. The show performed at Pleasance 2 throughout the whole of August and won the The Indies Best Theatre, Family, Musical or Dance Show at the Pleasance. At the Edinburgh Fringe Festival in 2016 we were up there with the first fully fledged Kriya Arts production. HIP is a one woman show created and performed by Jolie Booth as an Extra-Live production. The five show run received critical acclaim and has subsequently toured extensively throughout the UK and internationally in 2017. This then led to an interactive walking tour theatrical experience; HIP Trip of Brighton: A Psychedelic Wander that premiered at the Brighton Fringe Festival in May 2017. Building on previous successes, Kriya Arts produced multi-award winning Backstage in Biscuit Land which toured nationally in 2016 as part of the House network and BAC's Collaborative Touring Network. It then went on to tour in Canada and the US with the support of the British Council. In 2015 Backstage in Biscuit Land was presented as part of both the British Council Showcase and iF Platform at the Edinburgh Fringe Festival. In November 2015 the show featured as part of BBC4's On Stage: Live from Television Centre. At the Edinburgh Fringe Festival in 2014 it won Total Theatre's Emerging Company Award. Kriya Arts also produced Tangram Theatre Company's ThreeWeeks Editor's Choice Award winning "Scientrilogy" which included Origin of Species... the Off West End Award winning Albert Einstein: Relativitively Speaking and most recently The Element in the Room. In 2015 House awarded Kriya Arts their greenhouse fellowship working with Harlow Playhouse and Hertford Theatre to support a step change in their approach to diversity and access. Kriya Arts has a large database of venues, industry contacts and PR connections. Our unique touring style can be tailored to suit your needs. No project is too great or small. We have at our disposal a vast network of talented folks who can help you in any task you throw at us... or at least we can point you in the right direction. Problem solving. Budgeting. Book Keeping. Accounting. Fundraising. International Touring. Networking. Communicating. Public speaking. Colourfully presenting. Sticking to the integrity of an idea. Organising. Logistics. Bookings. Contracts. Marketing. Promoting. Branding. Designing. Web presence. Websites. Photography. Customer liaising. Inspiring. Team work. Creative writing. Obvious track avoiding. Quirky embracing. Coolness enhancing.